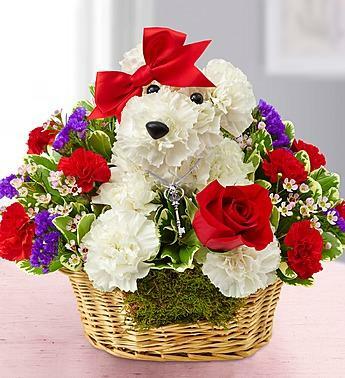 This precious flower pup is the perfect gift for your pick of the litter! From our truly original a-DOG-able® collection, it''s a fun and flirty surprise hand-crafted in a dog bed basket from fresh white carnations, a red rose and more, and finished off with a bright red bow. We''ve even added our charming, heart-shaped key necklace to really unleash your Valentine''s smile!